Fedoskino artist Nikolaj Zotov, a well known name to box collectors throughout the world, heads the showing this week with a sensational work called "Sadko". This lacquer box-sculpture features the underworld kingdom of the Sea Tsar, and its mix of intricate art work and magnificent sculpture, created from papier mache and iridescent shell, is truly a treat for the eyes. Following this comes "Alice in Wonderland", by Oleg Yastrebov. 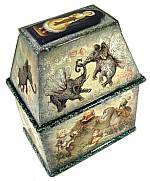 This large box with drawings all around puts Alice in a glittering fairy tale land, where elephants fly and old men befriend walruses. Truly magical! Also in the top row is "Fall", and this one is no less intriguing than the other two with its radiant golden palette. Nine other boxes fill up our showing, all special in one way or another. By the way, we thought that showing showing would be the last for awhile. But good news - it's not! We find that we actually do have enough boxes on hand to have one or two more showings, and shortly after that we should have more boxes coming in. So join us next week and the weeks to come as the parade of lacquer art continues! 4.25" x 3.13" x 0.75"
5.88" x 3.13" x 1.38"
5.25" x 2.75" x 1.00"
4.00" x 2.88" x 1.63"